256. 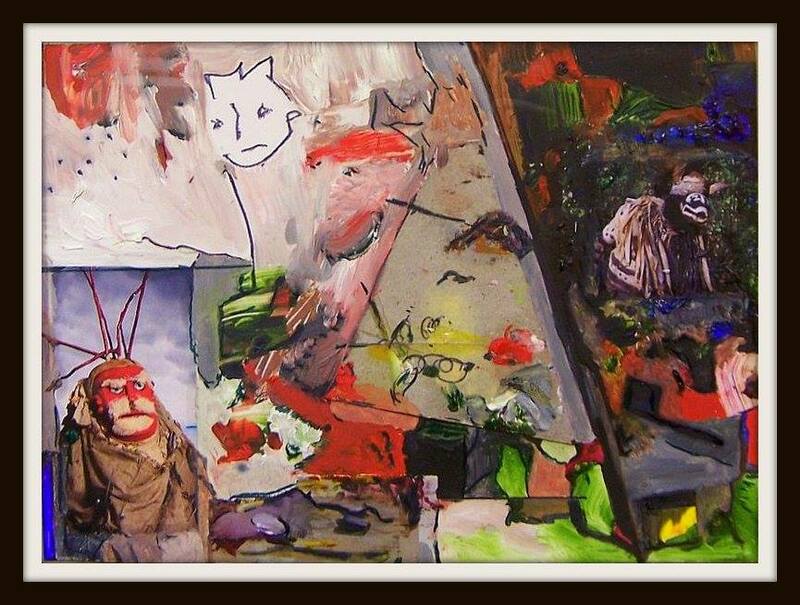 'House of Mirth - 20x8 inches, appx. framed for hanging. Oils, mixed-media, colors, pencil wash, and fabric-strip. $210. will ship, protected; or deliver, within reason. 255. 'Beyond the Jubilee - (a quite raucous fellow)'... - 20x8 inches, appx. framed for hanging. Oils, mixed-media, colors, pencil wash, and metal-strip. $210. will ship, protected; or deliver, within reason. 254. 'INVIDIOUS' - Oils on canvas, appx, 18 inches square, framed. $300. UPS/ship, additional $26.00, protected. 253. 'Insurmoutable Objects : (in so many ways) - Painted on found wood, large nail, pencil, colors, wood strips, mixed media. appx. 8x10 inches, overall. $80. - Will ship, addtl. 252. 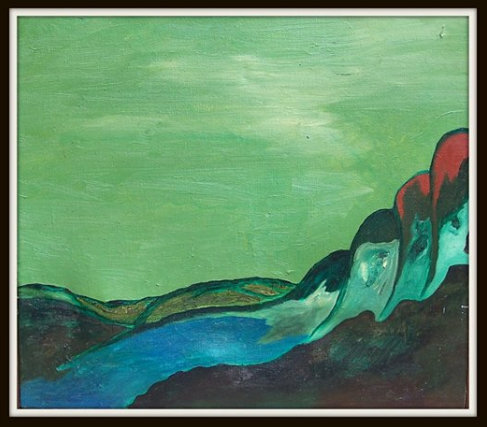 'Oasis' - Painted on found wood. Mixed media. Seashell, wood pieces, pencil markings, as shown $110. 252 - 'Kim' - Painted on found wood, appx. 8x8 inches. Colors, markings, pencil lines. $40. 250. 'President' - 6x10 inches - Painted on found wood, colors, pencil, markings. $40. 249. 'Incontrovertible' - Paints, colors, pencil lines, mixed media, twig, drawing - on found wood. Appx. 12x8 inches. $200. Will ship, UPS, addtl. $12. 248. 'Leaving Haverstraw' - Oil paints, on found wood, primed, markings, pencil, and sea shell. 10x13 inches, overall.$260. Will ship UPS $18. addt'l. 247. 'Sonnet' - 10x12 inches, appx., wood/2 horseshoe crabs, dried and cleaned, mounted as shown. $45. UPS ship, addtl. $110. 246. 'Technical Advancement' - Oils, mixed-media, pencil lines, glue, dirt, a screw, and a matchstick too - 10x10 inches, square shadow box, 1" recess/lip. As shown. $280. Will ship, UPS secure, additional 15. 'Integrity' - Wood construction, metal nut, found wood, paint. 8x10 inches, as shown. $120., will ship, protected, UPS, additional $10. 244. 'Camels' - Painted on found wood, as shown, mixed-media, pencil line, colors. 8X17 inches. $300, framed. Will ship, protected UPS, addtl. $20, or can deliver, within 200 miles. 243.' Nakashami' - Oils, mixed-media, 10x12 inches, appx. ; framed. $310; will ship, protected, UPS, addt. $15. 242. 'Generation Lost In Space - who says what?' - Oils on found wood, mixed media, 10x12 inches, Framed and finished as shown. $200. Will ship, protected. addtl. $20 - (can deliver, 200 miles, talk). 241. In the Kingdom of Three Moons' - oils, mixed media, 10x12 inches, framed. $300. 240. 'The Bounding Main' - As shown, wood/construction, oil paints, etc. $420. + shipping or I'll deliver, within 200 miles, no charge. Will pack/frame/ship, UPS. 239. 'Charley Rows In' - Oils on prepared surface. Mixed-media. 10X12 inches overall. As shown. $210. - Will ship, protected, addtn'l. $12. 238. 'Rail-Yard' - Made and put together just as shown. $600. But cannot ship, too delicate with loose stuff. Needs to be hand-delivered. Completely unique. 236. 'Vestigial Fins' - Painted on wood,, 12x12 inches square, as shown, dimensional frame. $200. Will ship, protected UPS, additional $15. 235. 'Here's House We Do It At Headquarters' - Oil paint, appx. 7x12 inches, framed, as shown. $235. Will ship, protected UPS, addt. $20. 234. 'Travelette' - Oils, mixed-media; on prepared card stock, 8x10 inches, appx. Matted/framed. $165. Will ship, protected UPS. $20. 232. 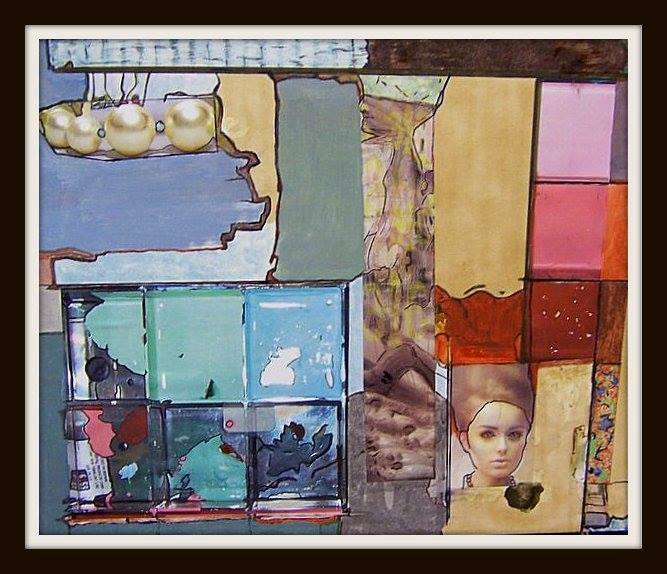 Friehof 1,2,3 -- Mixed media, painted on scrap wood, w/assorted items as shown; 12 x 15 inches overall. $500. UPS, protected shipping, addtl. cost, - at cost. 231. 'Bad Habits, a Ton At a Time' - Paint, on scrap wood, mixed-media. Woodstrips, a marble, metal grommets. 12x13 inches, Framed. $280. ; Will ship, UPS protected, at cost. 230. 'Horses, 1-2-3' - Painted board, on found wood, framed and constructed. 9x13 inches, mixed-media. $200. Will ship, @UPS cost. 229. PRIMOGENITURE - Oils on wood, mixed-media, sticks and things, appx, 9x14 inches. $200., will ship, $15, addtl. 228. A Kind of Self-Portrait, But Nameless. Watercolor / wash / drawing stick - on heavy cardstock, 8X10 inches. framed as shown. $105. Will ship, protected, addtl. $18. 227. 'Green Man With Cloth Shirt' - Oils on wood, wire, buttons, found wood, canvas board, scratch-markings, nails. $220. Will ship, protected and carefully packed, additional $30. 226. 'In Haste We Make a Moment' - Oils on canvas, 18x24 inches, as shown. $320. Will frame. Can ship, additional $30, protected. 224. 'Angel - You Make-a My Dreams Come True- - oils on board, 10x12 inches. $160. Will ship, protected, addtl. $10. 223. 'Heaven Scribe the Charnel House' - Oils on board; mixed-media. 12x14 inches. $200. Will ship, protected, addtl. $15. 222. 'Wilderness, 1875' - Oils on canvas, framed as shown. 11x14 inches. $210. Will ship, protected, addtl. $14. 221. 'New Ghosts of the Codicil' - Oils on ceiling board, 8x14 inches. $220. Will ship, protected, addtl. $15. 220. 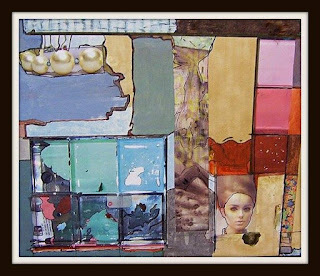 'I Guess I'm Not Too Particular About Things After All...' - Oils on wood; mixed media, sticks and tacks, and the rest. Framed, as shown. Appx. 10x12 inches. $340. Will ship, protected, additional $15. 'That Feeble Man Who Has the Manner of a Goat' - oils on ceiling board, appx. 16x20 inches. $180. Will ship, protected, addtl. $20. 218. 'When Things Begin Falling' - Oils on wood, mIxed-media, wooden ball, plastic car-model hood, and tire, metal level-glass w/bubble. Appx. 8x12 inches. $340., Will ship, secure. Addtl. $25. 217. 'An Amazingly Conquered Ambivalence' - Colors, wash, pencil, pen, mixed-media. 10x12 inches, framed. $268., will ship, adtl. $12. 216. 'FIELDAMENT - IN BUT A MOMENT' - Oils on wood, painted, mixed-media, appx. 10x12, framed in wood, as shown. $220. Will ship,protected, addtl. $20. 215. 'FOR DOVES OF THE ARMAMENT- - Oils; painted on wood; mixed media. appx. 7x12 inches, wood , not framed as shown. One penny; three wooden sticks, five upholstery tacks (quite old). $185. ; will pack, protect, and ship, addtl. $20. 214. 'oh Africa' - Oils on prepared canvas, mixed-media, framed as shown, 10x12 inches. $155. Will sip, protected, addtl. $15. 'MYSTIC MANKIND'S MAGIC MANTLE' - 2 drawings, colored pencil on white artboard. As shown. The pair - $85. 'BIRD CALLIOPE' - painted on wood, mixed-media, 7x15 inches, appx. $195. Will ship, protected; addtl. $12. 211. 'AFTER THE MEDICINE MAN, THE INDECIPHERABLE PAST' - Oils on white board, mixed-media, framed as shown, 10x12 inches. $165., will ship, addtl. $10. 210. 'WHEN THE STARS CROSS WITH THE PLANETS' - Oils on stretched canvas Appx. 10x12 inches, framed as shown. $180., will ship, addtl. $10. Can frame, addtl. $20.